"Außenspiegel 66-70 B-body /66-72 A-body /65-68 C-body, links & rechts"
kann recht und links verwendet werden. 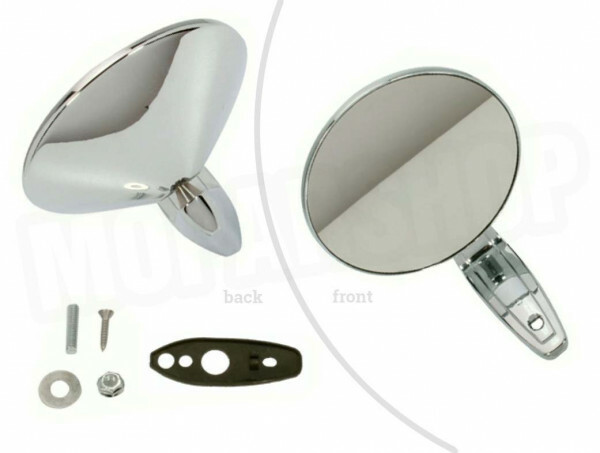 New reproduction door mirrors for A-body, B-body and some C-body vehicles (fits LH and RH, base is standard on both). Our triple chrome-plated manual mirror reproductions are made to original factory specifications to ensure a precise fit and authentic look on your Mopar. The mirror comes with all mounting hardware and gaskets for easy installation.